Mega Power Transmission Treatment end your sticky transmission problem and restores its smooth shifting performance, with this new, 3 way, 3 action product from Mega Power. 1- By cleaning sticky binding shift parts. 2- Smoothing parts that are wear roughen. 3- Then coating your problem causing parts - ending your problem. Those 3 advantages ends sticky shifts. The special ingredients target wear-increasing problem areas, including sticky shift control valves, binding gear shafts, o-rings, and such, to restore your cars smooth shifting again. Transmission problems are costly to end - if repaired. And a good product to end your transmission problem. This avoids the need for repair, or eliminates that need. Or money refunded if repair is done to fix it. It's a simple, two-step a method I teach mechanics to use; when their customers transmission or engine needs such help. of course they charge a lot more to do the install and service. but way cheaper than repairing. This treatment protects both new, re built, and transmissions with sticking, or rough shift, and a leak problems. Some car makers have, or are using the product to avert wear problems, by installing it on the assembly line, or recommending its use [in some country's]. Sticky shifting between gear-shifts appears after abrasion from heat, fluid breakdown, acid, and friction roughen and sticks, or binds transmission gears, pumps, valve body, pistons, rings, and such. You can end your transmission problem, and promote years more dependable service to it using this anti-wear and problem solving product. Here are the steps. I've made them easy for you to do. No special skill or tools required. Mega Power Transmission Problem Solver. Saves your transmission. Avoids costly rough shift repair need. Includes instructions and my phone help. Money-back if its not as advertised. Just $75+ $15 s&h= Tax 7= $97 total. Order today, get our top engine protector. A $49 value free! Just $75+ $15 s&h= Tax 7= $97 total. Total 4 items. Save $49. Order 6 Treatments to keep on hand for customer transmission servicing. Easy 15-30 minute service. Price is set by fluid, filter, and Mega Power cost, plus $50 to $150 labor. If using flush machine add T1 as described below. After fluid exchange, add T2 and T3 to new fluid. I usually add Mega Power to a full level, not as a top off fluid. Directions: Add item T1 to old fluid. run motor, shift thru all gears and park position 3 times. Shut off motor and drain fluid. Change filter if doing so. To new fluid add T2 and T3 to new fluid. Double check level after 5 minutes of running motor. We'll honor any refund up to $50. Send in customers hand written statement they were refunded their cost by you. Or copy of transmission repair invoice. One refund requested last 267 days. Order click cart button. Your price for 6 treatments. Just $240+ $$20 s&h= $260 total. Tax copy. $43 each. Mega Power's Two Step Procedure restores smooth transmission shifting, using a special cleaner, conditioner, and anti-wear. Brands that are solvent based destroy your oils ability to lube and protect as it cleans. That is no good for your transmission. Stay away from them. Learn more about the dangers of solvent additives and why they are bad for your transmissions good health. The Mega Power way extends more help your transmission needs with the other two items in the treatment - a conditioner and protector. They are added with the new fluid. This is step two. Those two protectors continue the healing and smoothing process - as you drive, ending your sticky transmission problem, by changing wear roughen surfaces that touch, slide and spin to smooth. This is the second advantage your transmission needs to regain its smooth shifting smoothness - usually in a day or so of driving. 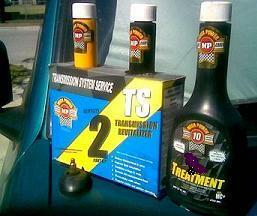 sticky transmission tune up product.. If you have a question about your problem or want to try this product, call me... george, at 512 665 3388. To order what you need, or have a question, call or email me. Email: megapower@grandecom.net Prompt replies always. Mail: Include your problem, product wanted, phone info. Order by mail or email. Checks OK.
Mega Power ends sticky transmission problems.